We consulted with top interior designers to develop colors that clients are requesting. Some are previous custom colors that we added to the collection, which means you can receive these preferred hues quickly. All 15 colors are included in our Guaranteed In Stock program. Garrett Leather welcomes Kelly Bruno as Account Executive for Ontario and Quebec, Canada. Kelly has over 15 years of experience as an Architectural Specification Representative within the A&D community. For the past decade, she provided technical support and specification information to interior designers for surfacing materials. In the years prior, she worked with textiles and wall coverings. She earned her degree in interior design and has in-depth knowledge of material selection and procurement. She looks forward to working with you to find the perfect leather and wall applications for your next project. To schedule an appointment, please contact Kelly directly at kbruno@garrettleather.com or call 416-998-4418. Garrett Leather is celebrating its 30th anniversary. To mark this important milestone, the company is pleased to introduce two new chic leather collections: Jubilee and Jubilee Gem. Jubilee is an Italian semi-aniline leather with a consistent grain. Each hide is milled to create a soft hand while maintaining a beautiful high sheen surface. The festive color palette includes in vogue colors such as Iced Champagne, Glitter, and Rose Gold. Jubilee Gem is also an Italian semi-aniline leather. Prior to milling, each hide is embossed with an elegant pebble pattern. This textured leather has the appearance of sparkling gemstones as light reflects off the surface. Careful milling creates a soft hand while maintaining the beautiful high sheen appearance. Both Jubilee and Jubilee Gem are recommended for most upholstery applications, including seating, furniture, wall coverings, and accessories. These leather collections are sold by the half hide. Hide sizes vary between 20 to 30 square feet. All ten colors of both Jubilee and Jubilee Gem are in stock for immediate shipment. 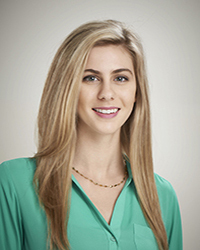 Garrett Leather welcomes Lucia Portali Waters as Account Executive in Manhattan. Lucia is very passionate about leather and has comprehensive knowledge of many aspects of the leather industry. She also ran her own art and design business and has extensive experience working with designers, architects and purchasing agents throughout the A&D community. Lucia takes pride in providing outstanding service and helping clients find the perfect leather for their project. Please contact her directly to request samples, discuss a project, schedule an appointment, or book a presentation. Garrett Leather warmly welcomes Corbin Perkins as Account Executive for all markets, excluding residential design, throughout Northern Texas, Oklahoma, and Northern Louisiana. 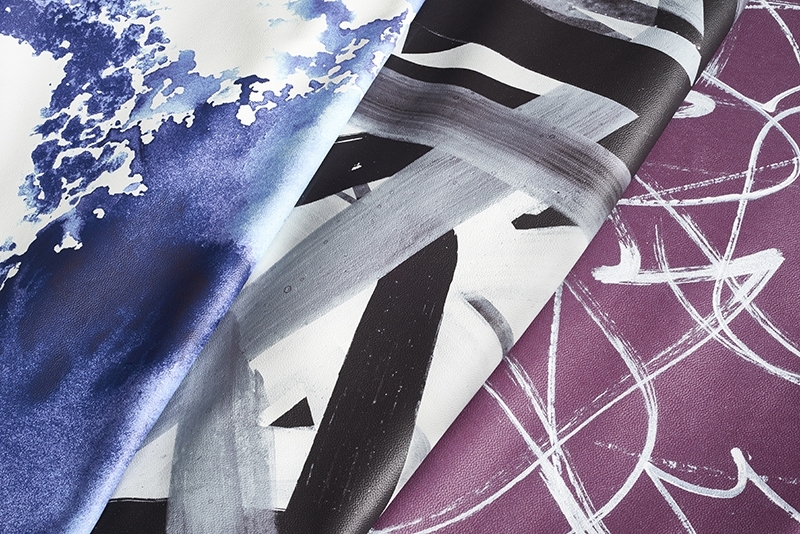 Corbin has over 15 years of experience in textiles within the A & D community. He excels at working with clients as a solutions provider and is passionate about developing positive rapport with prospective and existing customers. If you are currently working on a project with leather, please contact Corbin to deliver samples or for a product presentation. Contact Corbin directly at 214.304.1632 or email cperkins@garrettleather.com. We’ve combined the worlds of art, technology, and luxury to create the Denizen collection. In collaboration with the talented artists at Wrapped, a fine art studio known for creating original contemporary works of art, we developed these exclusive designs specifically for leather furniture and wallcoverings. The vivid colors and bold patterns are digitally printed onto center-cut pieces of leather, adding a dramatic component to any interior. The collection is named Denizen, meaning inhabitant, in honor of the diverse body of people that make the city of Los Angeles so special. Each design in the collection is as unique as the neighborhoods which comprise the city. Inspired by culture from all across the city, from the indie-vibe of Silver Lake, to the natural beauty of Topanga, to the street art in Dogtown, the home of Wrapped. This collection attempts to showcase the many facets of Los Angeles with a collection as simultaneously varied and cohesive as the city itself. With the Denizen collection, we pay tribute to diversity. Not just throughout the beautiful city of Los Angeles, but throughout our entire country and around the globe. Our hope is that these unique designs help to inspire, delight, and unite us all. Kathan spent more than a year working as an Account Manager at our corporate headquarters. She recently moved to New York City to start her new role as Account Executive for the Greater New York Region. As a new Account Executive and leather resource, Kathan is happy to provide product presentations, hand deliver samples, and help with any questions or concerns her clients have about leather. Contact Kathan directly at 929.275.5027 or email klarose@garrettleather.com. Torino was inspired by the breathtaking landscape of the mountainous Turin region in Italy. These Italian hides feature an attractive, welcoming pebble grain surface with a durable, waterproof finish. Torino is made to withstand the test of time and is recommended for all upholstery applications, especially high traffic areas. Learn more about Torino and request samples today! A brand new color has been added to our black collection. Due to popular demand, Flight Rook is now available for immediate shipment. Request a sample today! Flight is an Italian leather that has a soft hand and smooth, elegant appearance. It is produced to pass the rigorous 60-second vertical burn test without requiring any additional treatment. While Flight is optimal for the aviation community, its beautiful earth-tone color palette make it a viable option for any upholstery application. All 21 FiberDye® colors are in stock for immediate shipment.